Emma Young takes her place as fourth poet laureate of West Tisbury. Emma Young has been spreading the gospel of poetry throughout West Tisbury for years, but now she has an official pulpit. Last week, the town selectmen appointed Ms. Young to the position of poet laureate. She’s the fourth scribe in town to hold the title, and at 28, she’s the youngest. “Like so many other artists I do lots of other things and so this was reminding me that people in the community think of me as a poet and want to encourage and engage with that,” she said of the honor. A West Tisbury native, Ms. Young has been writing verse since Jill Lane’s poetry unit in the fourth grade. Now she prints her own poems on an antique press and has compiled six collections. Her poems are often brief and draw on her own experience. They invoke scenes from her daily life, and often incorporate Vineyard imagery as well as bits and pieces of books, movies, and dreams. When a poem is finished, she moves into the design realm, carefully crafting the visual aspect of the poem and often printing it by hand. As poet laureate, Ms. Young’s only official duty is to write one poem for the annual town meeting. This year, outgoing laureate Justen Ahren will present his third and last poem in that venue. Next year, Ms. Young will perform one of her own. Established at town meeting in 2006, the honorary position is unpaid and loosely defined. Poets laureate are expected to promote poetry in the community, but the manner in which they do is up to interpretation. “The poet laureate must be a West Tisbury resident, a published poet and be willing to sing the praises of poetry loud and clear throughout the land,” said library director Beth Kramer, who sat on the committee that recommended Ms. Young for the post. The library received 30 to 40 nominations from community members, several of whom named the same candidate, but ultimately Ms. Young was chosen because of the work she’s already done to promote the art form. “She sees herself as a poet and has for many years, she writes beautifully and has done a ton of outreach as an independent poet,” Ms. Kramer said. “Her energy around poetry and sharing it with the masses is in large measure why we chose her from the applicants,” she added. Ms. Young, who attended Hampshire College before returning to the Island, has collaborated with the previous poets laureate — Fan Ogilvie, Dan Waters, and Justen Ahren — in various contexts over the years. Mr. 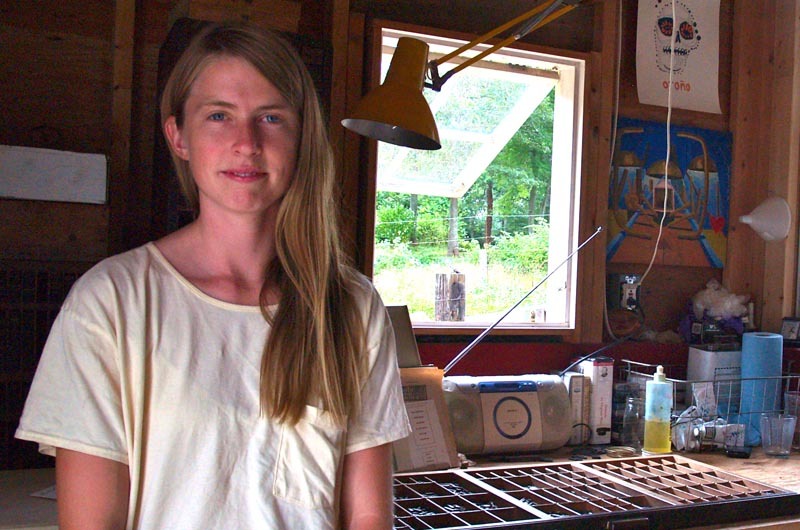 Waters, also a printer and printmaker, has mentored her in the art of letterpress. She said she has always found support in the literary community of West Tisbury, and will use her new role to continue that engagement. This summer, she plans to organize poetry readings at the library. This is wonderful!! So close to home for all of us - a chance to connect with your poetry - congratulations Emma. Congratulations Emma! So wonderful that you will be sharing your gift of poetry to others !